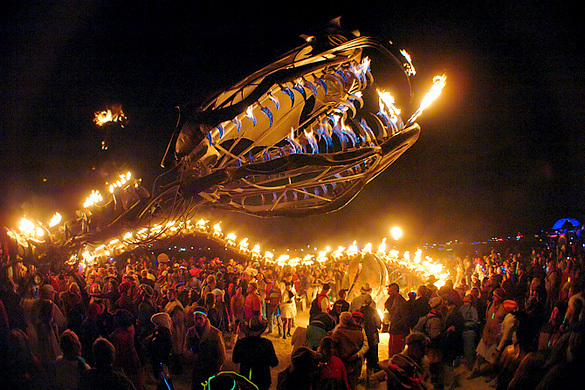 Any description of the Serpent Mother pales in contrast to experiencing this massive burning work of art that includes welding, plumbing, hydraulics, flame effects, electronics, and interactive controls. A visitor can, for example, be in the center of this coiled skeleton and push buttons that blow out huge flames from its spine, and even open the serpent’s central egg. And 1,700 liters of liquid propane gas is consumed each evening at Burning Man. Yet, what is also amazing is that the builders, the Flaming Lotus Girls, are a loose organization of women who built it, many who have never welded nor did any electronics before. stainless steel, copper, light and fire, 65' x 50' installation footprint, 10 ton sculpture, and a11'x5'x5' head. All flame effects are operated by the audience. Hot blue jets of flame emanate from its teeth. Dramatic steam blasts from the nostrils. The eyes glow bright green. Fabergé egg façade. The egg in the center of the coiled serpent cracks open for a main flame effect. 50' large multi-color flame effect. Fierce blue propane flames.